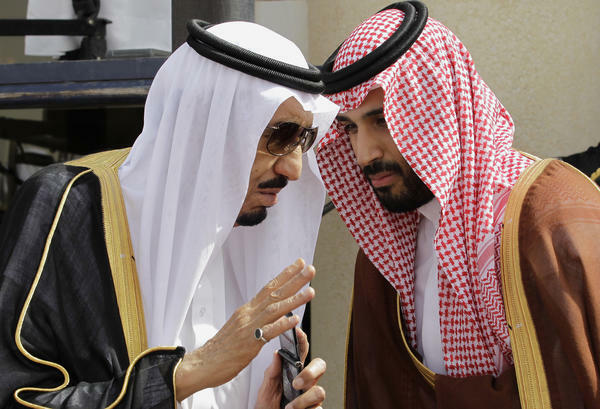 Saudi Arabia's King Salman (left) speaks with his son Mohammed in the capital Riyadh in 2012. The king was the crown prince at the time. When he assumed the throne last year, Salman named Mohammed, now 30, the deputy crown prince and defense minister. They have pursued a much more aggressive foreign policy in the region, particularly when it comes to confronting Iran. In the wake of the crisis with Iran, Mohammed bin Salman, the kingdom's deputy crown prince and defense minister, as well as King Salman's favored son, gave a five-hour interview to a reporter from The Economist, and the British news magazine published the entire transcript. This is a land where senior figures have rarely given on-the-record interviews. So it was striking that he had so much time to spend with a Western reporter at such a tense moment. Saudi Arabia executed a prominent Shiite cleric on Jan. 2. An Iranian mob then attacked the Saudi Embassy in Tehran, which resulted in the Saudis breaking diplomatic relations with Iran. Also noteworthy, the reporter was shown in a picture that accompanied the interview. While The Economist does not give bylines, the photo showed a female reporter without head cover or abaya, an unusual break from the traditional Saudi dress code, particularly for an interview with someone as senior as the deputy crown prince. Mohammed, who is 30, sought to reassure. The crisis would not lead to a war with Iran, he said. Anyone pushing for that "was not in his right mind," he added. He was asked, "Do you consider Iran to be your biggest enemy?" He answered, "We hope not." The more assertive public relations campaign says a lot about the new leadership in Saudi Arabia, where King Salman came to power in January 2015. While decision-making inside the palace remains opaque, Salman's son is the public face of a new interventionist foreign policy. The confrontation with Iran is the latest gamble, say regional analysts, and has taken place despite warnings from the Obama administration that this is a dangerous policy, inflaming sectarian tensions across the Middle East. It shows a new mentality in Riyadh, says Kristen Diwan, a senior resident scholar at the Gulf Arab Institute in Washington. "When you are in this fight over the future, the leadership is not looking at the costs," she says. "They are setting the groundwork for the battle they need to do now." Many Saudis have applauded the tough stand toward Iran. "It does seem popular here," says one Saudi analyst, who offered comments anonymously to speak on a sensitive subject. On social media, which is huge in the kingdom, ordinary Saudis are backing the leadership in the confrontation with Iran and the bombing campaign in Yemen. The Iranian attack on the Saudi Embassy created an opportunity for the Saudi leadership to take a tough public stance against Iran and express the kingdom's opposition to Washington's improving relations with Iran that has come as part of last year's historic nuclear deal. Saudi Arabia remains a key U.S. ally. But the Saudis strongly oppose the nuclear deal and fear that any improvement in U.S.-Iran relations will come at the expense of the kingdom. Saudi Arabia's recent moves are designed to show that the Saudis still view Iran as a destabilizing force, says Theodore Karasik, a political commentator based in the United Arab Emirates. "It's part of the Saudi strategy to force Iran to show its true colors," he says. Many international sanctions against Iran are expected to be lifted in the coming weeks. U.S. Secretary of State John Kerry said last week that Iran was "days away" from complying with its obligations under the nuclear deal. Iran is hoping to expand its oil exports, though it will have to find international investment to rebuild its oil and gas industry. The diplomatic crisis with Saudi Arabia could complicate the equation for international companies trying to assess the risk of working in Iran, according to oil industry analysts. "Iran is a big country. It's a potentially rich country and a major competitor to Saudi Arabia. They don't feel strong enough to be in a power relationship," says Jean-Francois Seznec, a Middle East specialist at the School for Advanced International Studies at Johns Hopkins University in Washington. This past weekend, the Saudis stepped up the war of words at an Arab League emergency meeting, called by Riyadh. Arab foreign ministers issued a statement condemning Iran for "meddling in Arab affairs." The harsh declaration came despite Iran's letter of apology to the United Nations for the attacks on Saudi diplomatic facilities.